If you’re dead set on seeing a black person, I can give you directions to where a black man is—I wouldn’t want you to go home disappointed. He’s always there, so you need not worry about dropping in while he’s out doing his shopping at Mercado Hidalgo. And truth be told, in these days as he gets older, he could use the company. If this were a century ago, I’d give you directions from the docks of the port. They were open then; but now they are inaccessible to those who do not have customs clearance. Or perhaps I’d give them to you from the train station. The Porfirian era building is still there, but that mode of transportation has fallen by the wayside. With no logical arrival point and the rapid expansion of the city that has led to over half a million people calling Veracruz home, I want to make sure you can find him. I suppose the easiest way I can direct you is from the zócalo, the main plaza of the historic center. Veracruz’s zócalo, like many, is a vibrant place that locals and tourists simultaneously use in different ways. There is a wide open space that is generally empty in the heat of the day, a permanent stage, and a copse of bushes and palm trees surrounding crosscutting pathways that offer shade. If you face the stage, the municipal palace will be behind you and the famed portales with their roaming musicians ready to play a variety of genres including banda, mariachi, son montuno and son jarocho will be on your right. On your left will be the cathedral. Its recent coat of paint makes the façade stand out in a cityscape where old buildings are protected, but not preserved, and different architectural styles abut each other. 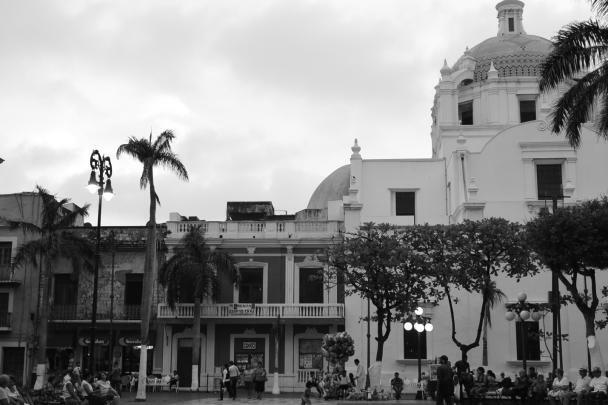 Go toward the cathedral, you will be moving away from the water and toward another flowing body—Calle Independencia. As you make your way out of the zócalo, the Hotel Diligencias —another allusion to an outdated mode of transportation—will be directly in front of you (1). Turn left, you’ll be going against the flow of traffic, alongside the church, and toward the Gran Café del Portal. You’ll see ambulatory shoe shines looking downward, trying to find someone in need of a polish, and marimba bands set up to play for the patrons who are taking their coffee outside under the lazily turning ceiling fans that futilely move the warm, humid air. You’ll have to cross the street and one of the fanciest looking McDonald’s in the area and keep going down Independencia for another block until you get to Calle Serdán and turn right. Not even halfway down the block you’ll see a diagonal callejón, take that. You’re almost there. I would say that the tree growing out of the abandoned building is a clear sign that you’re on the right path, but it’s a relatively common sight. You’ll be approaching him from behind, but trust me, the statue to Benny Moré isn’t going anywhere. Fifteen years ago the Cuban government and people donated the first statue made of their native son to the people of Veracruz, where, as the sculptor noted, he could “walk among the people who adopted him (2). Benny Moré was immortalized in Callejón de la Lagunilla, a once vibrant space filled with dancing bodies and the sounds of son veracruzano de la raíz cubana—a musical genre originally from Cuba but wholly integrated in Veracruzan popular culture. The anchoring club is no longer open, and the dancing bodies have moved on, but Benny remains. He is not the only Afro-Cuban honored in the historic center of Veracruz. There are plaques to the Cuban musicians Compay Segundo and Celia Cruz in the Plazuela de la Campana, another public space that still hosts four nights of dancing. What is more, Cubans are not the only Afro-Latinos memorialized. In the old neighborhood of La Huaca there is a statue to the famed singer Toña la Negra in the callejón named in her honor. She is, perhaps, the most famous Afro-Mexican there is and a source of pride for many locals in the port city. The most recent statue to be erected is also to an Afro-Mexican woman—La Negra Graciana, a world-renowned harpist in the son jarocho genre. A silhouette of her playing now stands in the heavily trafficked Callejón Trigueros, which links the zócalo to La Campana. The fact that there are statutes to people of African descent is not in itself noteworthy. Statues abound in the port city—along the malecón or boardwalk there are statues to the Spanish, Jewish, and Lebanese migrants. There are statues commemorating the soldiers who have fought and died in the four times Veracruz has been heroic. There is even a statue to Alexander von Humboldt. But the statues to the Afro-Latin American musicians are not on the water’s edge—they are within the lived spaces of everyday life in Veracruz. These statues—most of which were installed as part of government-sponsored cultural festivals—are permanent, inert ways in which locals are telling themselves and others about themselves. The historic mid-census survey of 2015 was the first time Mexico officially counted its population of African descent. For those who work in Afro-Mexican Studies, the breakdown in percentages follows predictions. The highest percentage of self-identifying Afro-Mexicans are in the states of Guerrero, Oaxaca, and Veracruz, in that order. This is what has been reported in the international and national press, and with good reason. The municipality of Veracruz only had over 25,000 individuals who self-identified as Afro-Mexican and another 5,000 who said yes, in part. In such a large city, maybe you won’t encounter those individuals—or maybe you will and not realize it. However, you will, invariably, see persons of African descent cast in bronze, looking out over a population whose local culture acknowledges and valorizes the contribution of people of African descent, both Mexican and otherwise. (1) Diligencias is a stagecoah or carriage used for transportaion. The contents of this blog do not necessarily reflect theviews of the Center for Latin American Studies or the University of Chicago.